Recognize the 37 basic postures of the Long Form. Grasp the strategies in alignment of those postures. Be comfortable and accepting of the natural flow in the form practice. The 4 "Basic Tai Chi Qigong" will be discussed and taught in depth; the "Wu Chi" stance will be taught and practised extensively; the details in alignment of the fundamental 37 Postures will be examined; specific kicks, punches and palms and their applications will be mentioned. 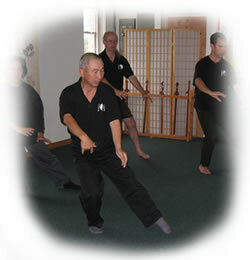 In general, this program provides a better understanding, use and practise of the Form.